This Is A Professional Fix! 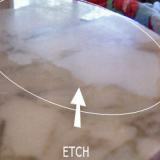 This marble polishing powder is user friendly, easy to use, and requires NO power tools. It's a unique combination of specialty abrasives and catalysts which makes the art of polishing marble relatively EASY! It's designed as a spot polisher to remove light etchings and water rings from your stone. It will restore the majority of water stains and acid rings from polished marble, travertine, limestone and any other calcite based stones. This is a professional grade product. It's user friendly AND enables you to polish marble like the Pros! Safe to use on food handling surfaces. Just sprinkle it on, spritz with water and rub. FAQ's on marble polishing powder. 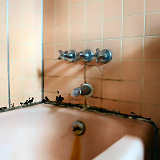 Spray a little bit more water on your "spot" and rub in the remaining Marble Polishing Powder. Use a very slight pressure and work in a circular motion starting small and widening (blending the edges) until the surface is shiny and dry. If you have water stains or dull spots on your stone, this polishing powder will restore the majority of water stains and acid rings from your polished Marble, Travertine, Limestone, Onyx, and other calcite based stone.